Afternoon loverlies! Hope all is fine in the world y'all are in. ;) I don't really have much to say on this Wednesday. Except for how crazy the weather can be in Arkansas. LOL It is 70 degrees today, but tomorrow it will be in the 40's. Then come this weekend we should be getting an ice storm. Yep, it starts. lol Oh well. I just pray and hope it won't be too extreme, and that everyone will be safe on the roads. I found out something awesome. I guess i'm just behind, because i'm sure other folks already figured it out. lol But I made some chalkboard prints!! YAY!!! How fun. You can either find chalkboard backgrounds on Picmonkey, or just Google chalkboard background. I can't afford Photoshop so I use Gimp to make my little prints. What I do is just Google for free fonts to use that you can download into Gimp. I also go to Deviantart to find paintbrushes, which you can also download into Gimp to use. Very simple. I decided to use this quote from Alice In Wonderland. I love that movie. I'm ashamed to admit never fully read the book, even though I do have it. lol I will get around to it soon. I promise myself I will. 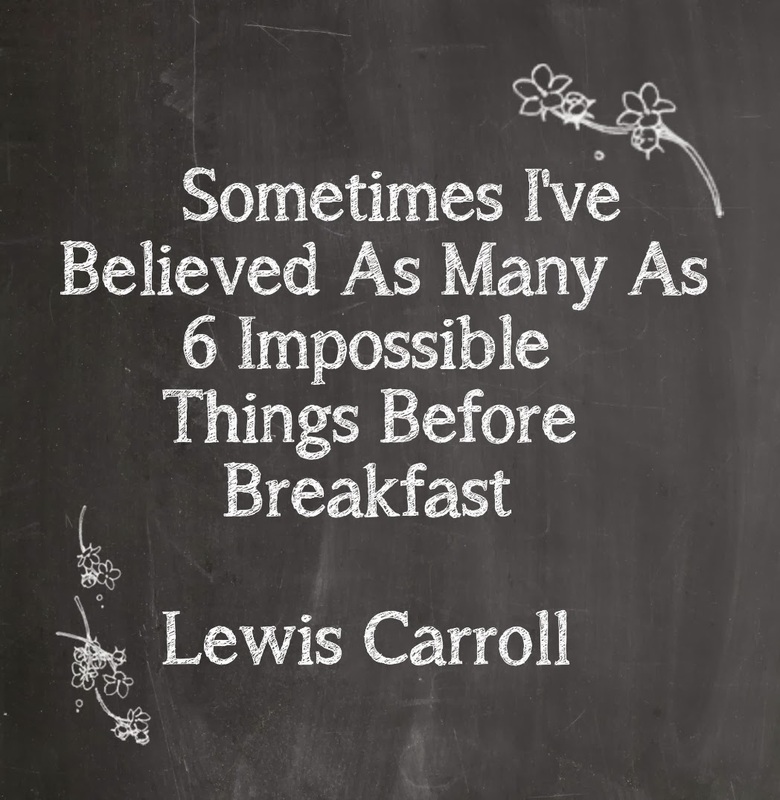 This quote stating she is believing as many as six impossible things seems very interesting to me. I believe in the bible and when I think about the stories in it, really there is nothing impossible right? So many impossible things actually happened that became possible. Especially if you have God in your life to be by your side and help you. Then nothing should be impossible. 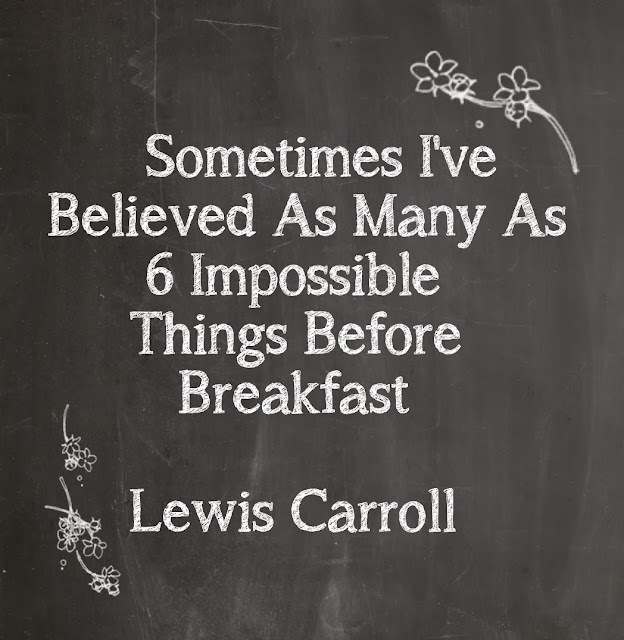 So maybe use this quote as, yes, let's think of six impossible things before breakfast (or really anytime lol), but make those impossible things turn into Possible things. WEEEEE!!! I'm sure it will be hard, but it would be a positive challenge for myself. Anyways, that's what I see when I see this quote. Also and how weird she is. I think that is one reason why I love Alice In Wonderland, because of how weird the story is. I relate very well to weirdness. Can't help it that's just how God made me!! It's taking me quite a while, but i'm slowly accepting my weirdness. I may get stares, but it makes me happy being myself. As it should for anyone being themselves. Ta Ta For Now! !